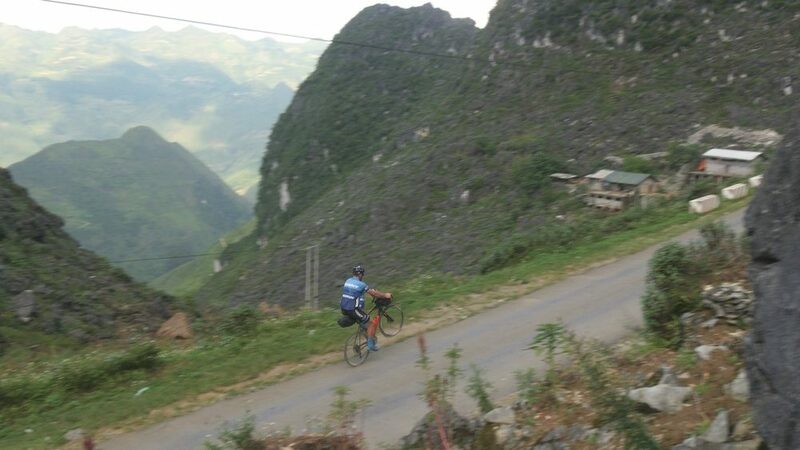 I recently got back from a bike tour of the Ha Giang Province in Vietnam. This remote hill tribe region tends to be a bit off the beaten track and offers jaw-dropping landscapes in every direction. 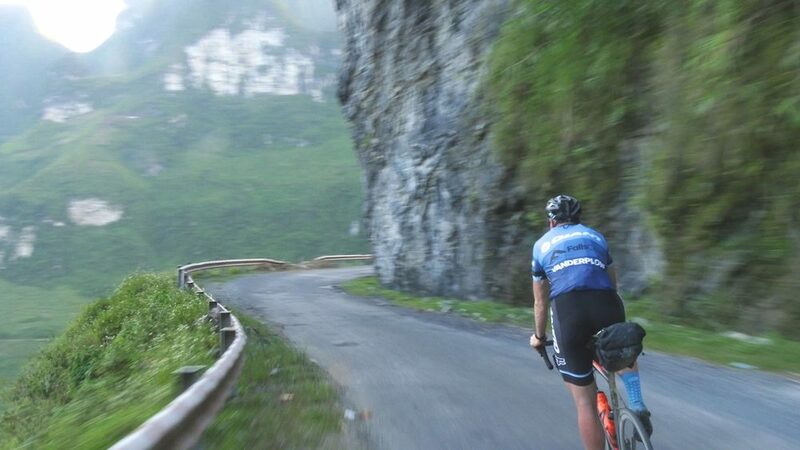 I can’t recommend it as a cycling destination highly enough! 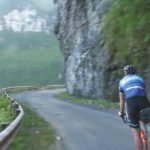 This is a gallery of my favourite photos from the adventure with professional cyclist Paul van der Ploeg. 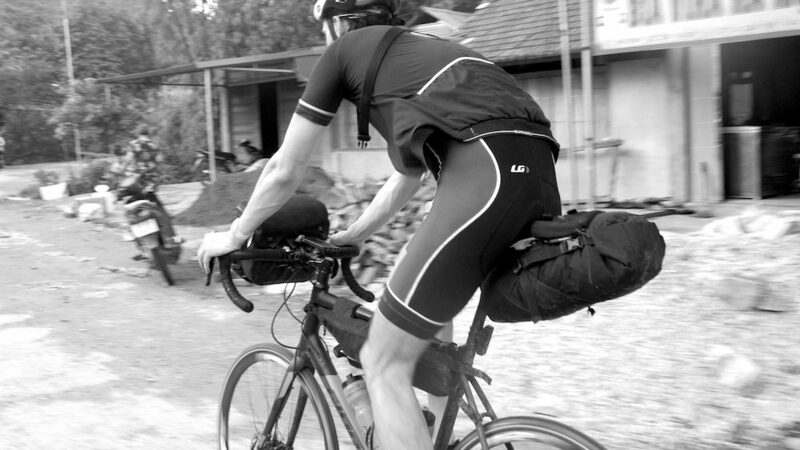 You can see my 5kg packing list for the trip HERE and we also threw together a short documentary about our time available HERE. 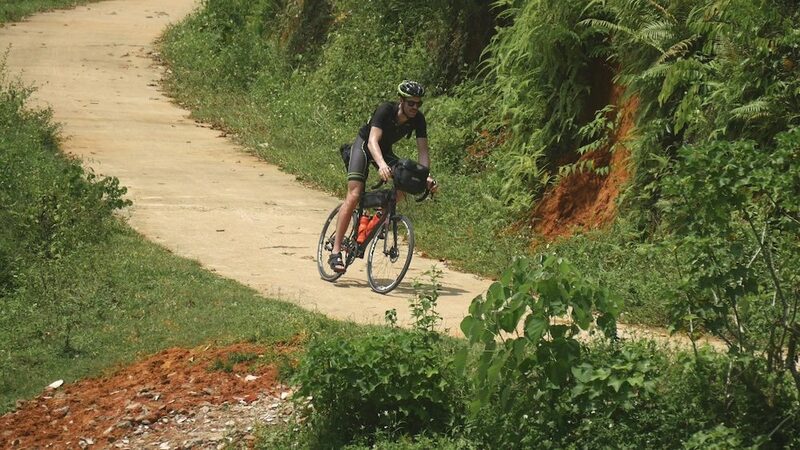 Riding out of Hanoi was busy, but quite manageable given the large roads that splay out from the centre. Within 30km we had found ourselves some quiet back roads that ran parallel to the busy trucking routes. It was an absolute delight riding through all of the small villages. Locals would often stop what they were doing and say hello! 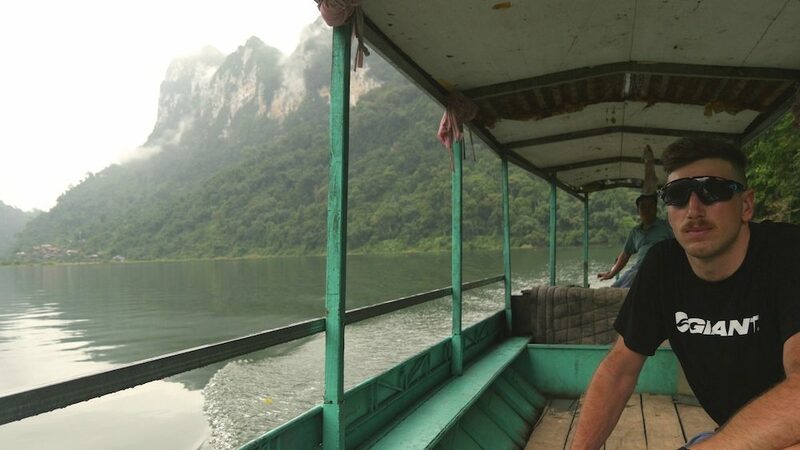 We spent a day on a boat on Ba Be Lake with towering 1500m high mountain peaks surrounding us. The biodiversity of this national park is outstanding, with 550 plant species, 353 butterfly species and 233 bird species recorded. 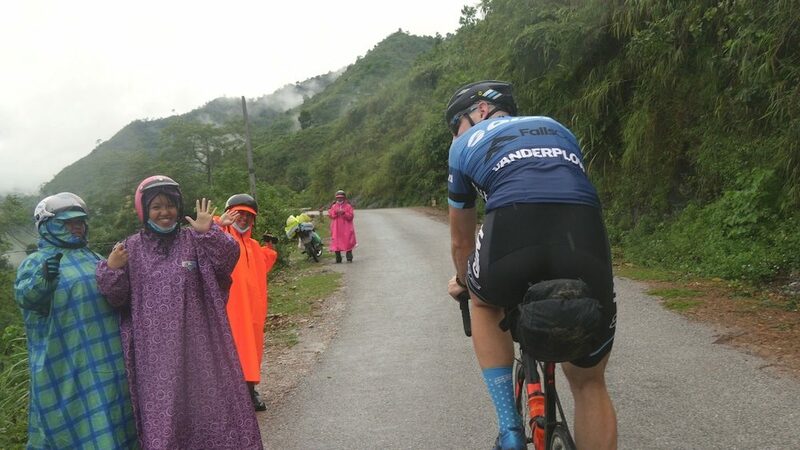 There was so much excitement and friendliness as we climbed the first of the big mountains en route to the Ha Giang Province. By the time we had climbed beyond the clouds, we were feeling high and at peace with our surroundings. 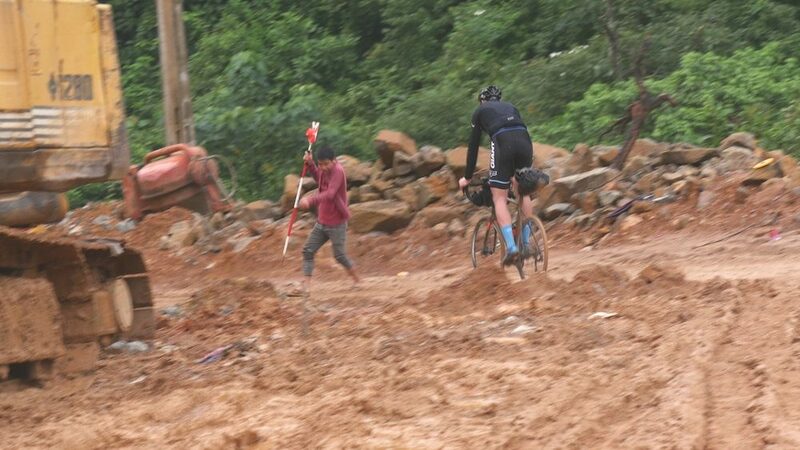 We took a short cut over the crest of our first long climb and the road quality deteriorated quickly. 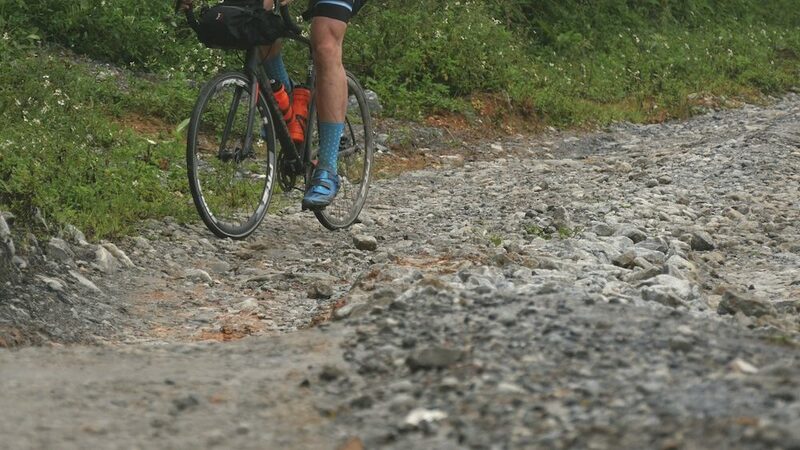 The Schwalbe Marathon tyres handled this rocky terrain surprisingly well. 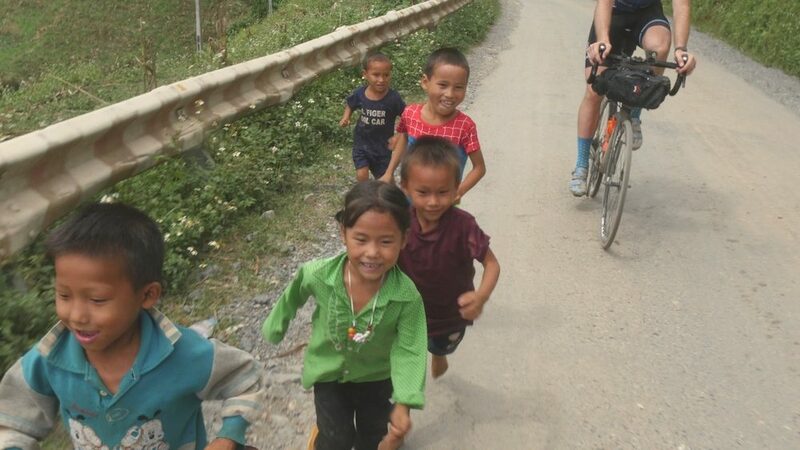 The children were very excited to see us in the mountain villages of the north, often joining us for a kilometre and giggling uncontrollably the whole time! It was very endearing. Despite our preconceived ideas, we found the road quality generally good enough for our Giant Contend road bikes with 28mm tyres. The hydraulic disc brakes on the bike made the tight hairpin corners not feel hairy at all. That said, sections of road works were very muddy, slippery and rocky and would be certainly better tackled with wider tyres. Riding at sunset is definitely the nicest time of day! 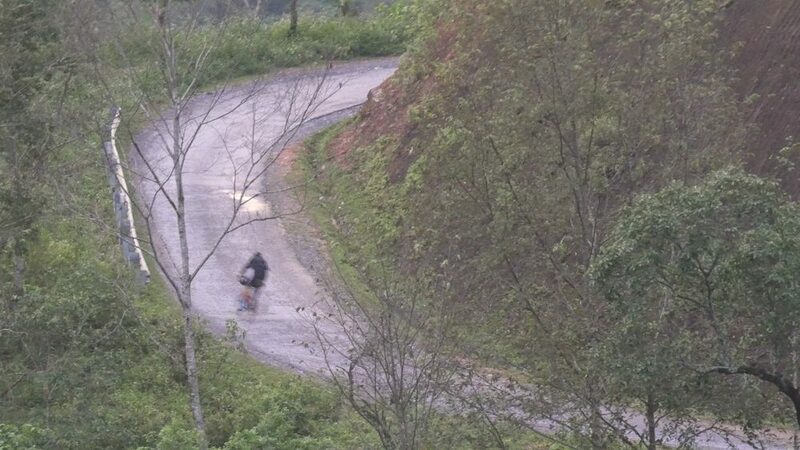 By late afternoon, the traffic is almost non-existent on the mountain roads. Big suspension bridges carried us between two sides of the gorges. 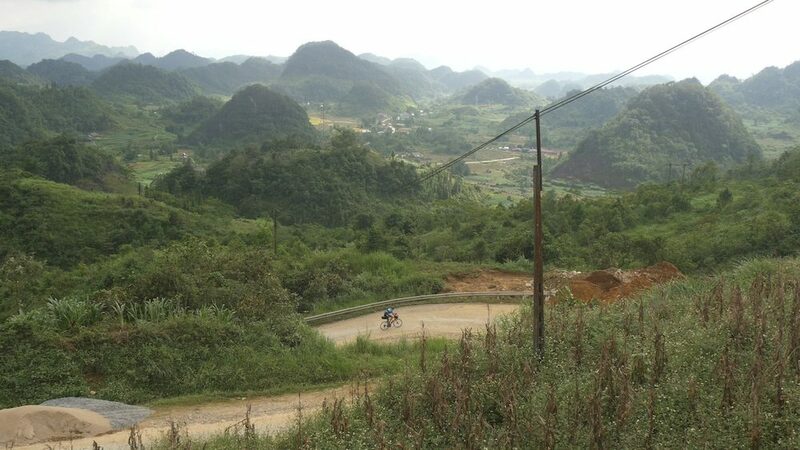 On the other side here was the mystical Ha Giang Province. The limestone karst topography in the north is ridiculous! 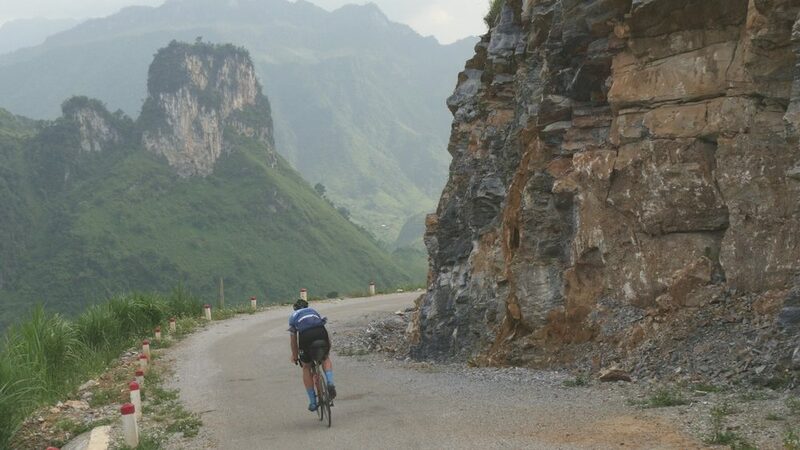 Despite the hard hitting climbs, the views over endless mountains is worth the leg-busting effort. 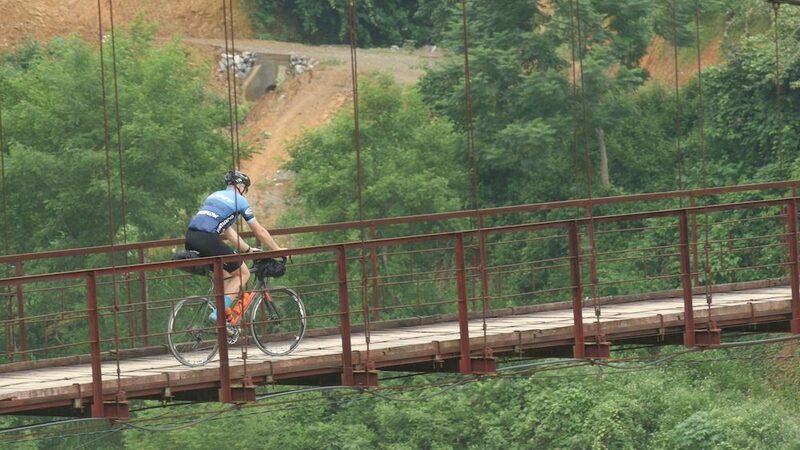 Paul showing off his bike handling skills on the famous road between Dong Van and Meo Vac. 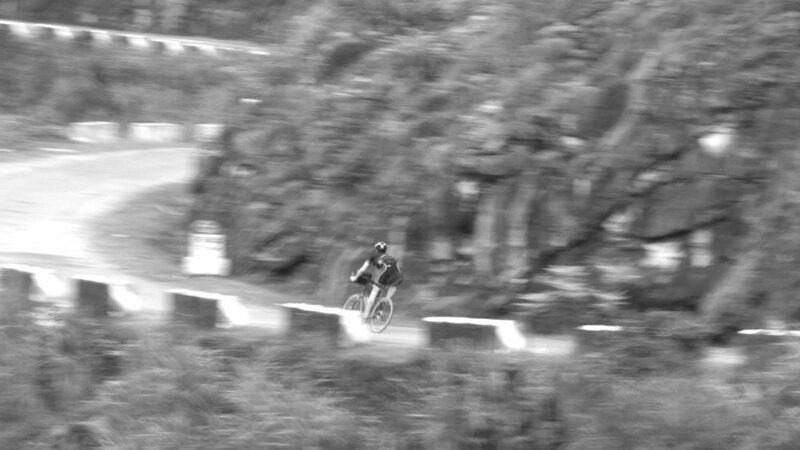 Cornering at speed on the exceptional Meo Vac road. 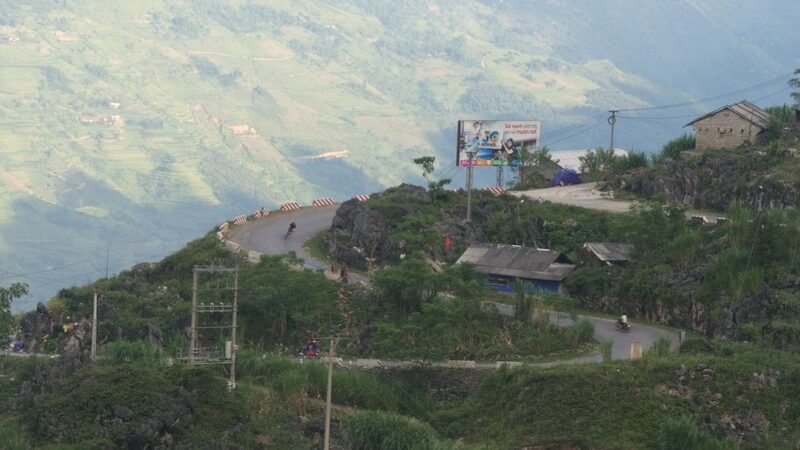 This is one of the highlight roads in the Ha Giang Province, and certainly the most famous amongst tourists. 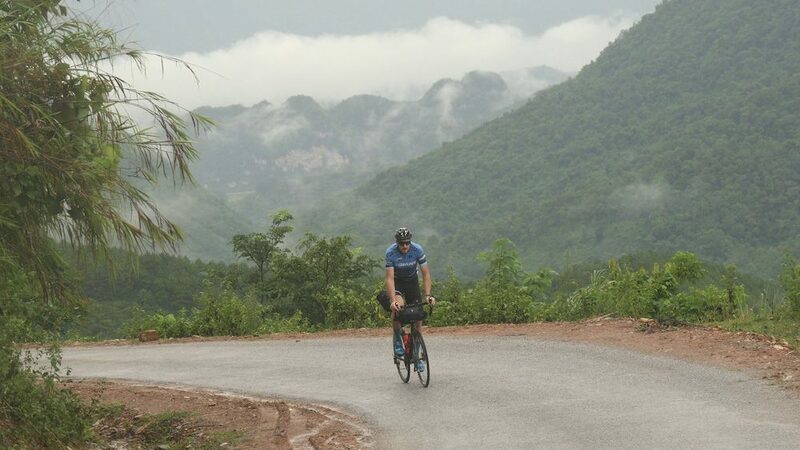 Not only are there hundreds of bends, but the views down the valley and up to the peaks are breathtaking! 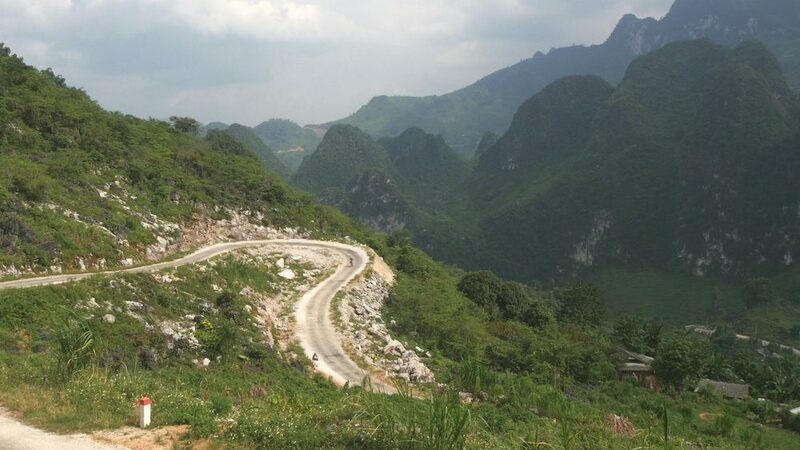 Our most favourite section of road was in the Lũng Hồ district. With no traffic and endless views, it was an absolute delight to ride along. Approaching Du Gia down one of the narrow mountain roads. 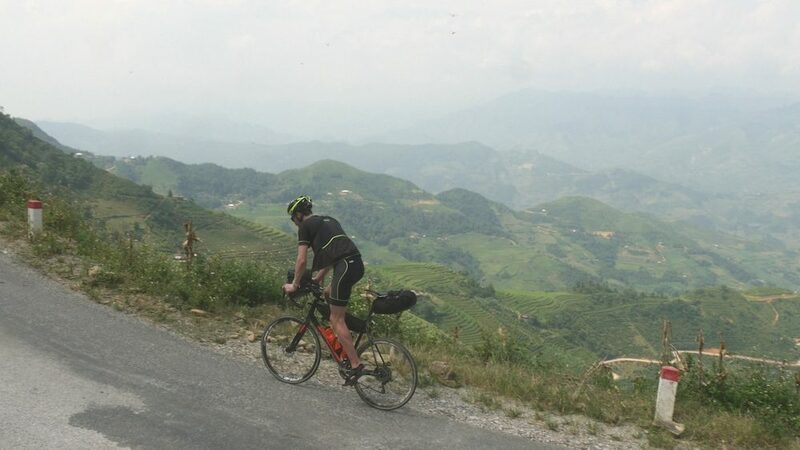 Climbing up one of the hardest hills in the Ha Giang Province, mostly due to extreme heat and very little sun protection from trees! 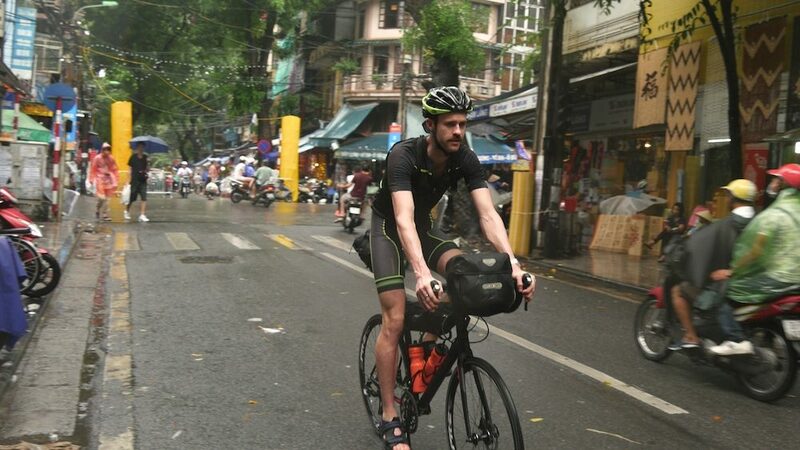 Have You Seen The Bikepacking Vietnam Adventure Doco Yet?